Is the Wheel of Karma Turning Against Chavez? From Nicaragua: Ortega in Free Fall, Opposition is ... ? The news out of Nicaragua recently has not been good for President Daniel Ortega, whose popularity continues to decline in the face of a wrecked Nicaraguan economy, personal scandals involving Ortega's finances and possible sexual misconduct with his stepdaughter, general public anger over the political deals made to enable his victory in the 2006 elections, and, well; there is more, but that will do for now. According to the most recent poll Ortega only has the support of 18% of the population while 56% steadfastly disapprove of him as President. There was a very successful march in Managua this past Friday in which numerous opposition groups joined together to protest Ortega's misrule of the country. According to the BBC, there were over 15,000 people in attendance. And so much of the anger voiced by the demonstrators was aimed at Venezuelan President Hugo Chavez -- I'm sensing a theme developing -- who has provided notable political and financial support for Ortega. The march also followed a smaller gathering of the previous Friday, June 22, that was largely organized by Nicaraguan youths who used the Facebook web spaces approach that proved so effective for young Colombians in February and March in their preparation of several very successful anti-FARC demonstrations. It is interesting that the fractured Nicaraguan opposition seems to have demonstrated a surprising willingness to act in concert in organizing the protest. Well; I guess it is better late than never. The absolutely senseless divisions among Ortega's opposition in the 2006 presidential campaign allowed the former Sandinista Comandante to win by default, whenever he never could have polled above 44% of the total electorate. Hopefully, the Nicaraguans have learned their lesson but we will just have to wait and see the proof. Might the Venezuelan opposition learn from this example? Might the Venezuelan opposition learn from their own mistakes? We can wish, hope, and pray. I heartily recommend interested readers examine several posts on this subject at Kate's A Colombo-Americana's Perspective blog. Kate has devoted a lot of time to observing -- and bemoaning -- Nicaraguan politics over the past couple of years, and she should always be kept in mind as a useful source of information on current events in the country. I am going to post a translation of a recent online article from Diario de América written by Venezuelan dissident in exile Mercedes Montero which presents her list of some 27 political prisoners now held by the Chavez regime. (I know she writes "25" but she actually has two more.) And as a final note of my own, Martha Colmenares insists that there are two important political prisoners whose names need to be added to this list; Gregory Umanes and Louis Chacin, both arrested in 2003. Mercedes Montero is a Sociologist and specialist in Organizational Development who has been an active spokeswoman for the Venezuelan resistance to Hugo Chavez since her self-imposed exile in 2005. She has been a regular contributor to Diario de América and you will find her work also followed closely at sites such as Megaresistencia (see 2nd post), Martha Colmenares, and others who publicize the still-unfolding tragedy of Chavez's rule in Venezuela. We do not hear much about Venezuela's political prisoners. They are much less well-known than those in Cuba, and even the cause of the Cuban prisoners of conscience is not as widely-recognized as it should be, in my opinion. But I submit that the Venezuelan story is worth knowing by all lovers of freedom and democracy. Let us remember that they all have been denied justice, they have not had formal judgement, nor due process. Let us remember that all their human rights have been violated. Let us remember that their families have suffered the insufferable. Let us remember that on multiple occasions different non-governmental organizations have denounced these cases before the Human Rights Commission of the Organization of American States (OAS), the European Union, the Holy See, and they have sent communications to the United Nations (UN), but they continue to be prisoners. Let us remember most of all that in Venezuela the rule of law has ceased to exist, that there is no separation of powers, and that everything depends upon the Executive Authority. The first eight have been prisoners for five years in the case of the events of April 11, 2002, they still have not been sentenced. 1. Agent (Metropolitan Police) Erasmo Bolivar, arrested illegally on April 19, 2003. 2. Distinguished (Metropolitan Police) Luis Milina Cerrada, arrested illegally on April 19, 2003. 3. 1st Corporal (Metropolitan Police) Ramon Zapata Alonso, arrested illegally on April 19, 2003. 4. 1st Corporal (Metropolitan Police) Arube Perez Salazar, arrested illegally on April 19, 2003. 5. 1st Sargeant (Metropolitan Police) Rafael Neazoa Lopez, arrested illegally on April 19, 2003. 6. Sub-Inspector (Metropolitan Police) Marco Hurtado, arrested illegally on April 19, 2003. 7. (Metropolitan Police) Hector Rovain, arrested illegally on April 19, 2003. 8. Sargeant-Major (Metropolitan Police) Julio Rodriguez, arrested illegally on April 19, 2003. 9. Silvio Merida Ortiz, arrested illegally on November 6, 2003, sentenced unjustly in the case of the bombing of the Spanish Embassy and Colombian Consulate to 9 years, 4 months in prison, and was tortured. His state of health is precarious. 10. Raul Diaz Peña, arrested illegally on February 25, 2004, sentenced unjustly to 9 years 4 months in prison in the case of the bombing of the Spanish Embassy and Colombian Consulate. His state of health is precarious. 11. Captain Otto Gebauer, illegally held since November 11, 2004, sentenced to 12 years, 3 months in prison, only for the deed of being seen mourning and praying for his life to the chief executive. 12. Juan Bautista Guevara Perez, illegally detained on November 20, 2004 and sentenced to 30 years in jail in the case of the murder of Danilo Anderson. In spite of the fact that Inspector Hernando Contreras stated that the testimony given by star witness Giovanny Vasquez does not deserve credibility and a falsity of evidence and documents existed, justice has not been done. 13. Ivan Simonovis, illegally arrested on November 22, 2004, in the case of the events of the 11th of April, 2002. Continues unsentenced in the longest trial in history. 15. Rolando Jesus Guevara, illegally arrested on November 23, 2004. Both brothers were sentenced to 27 years in prison. The same observations apply to them as to Juan Bautista Guevara Perez. 16. Lazaro Forero, illegally arrested on December 3, 2004. 17. Henry Vivas, illegally arrested on December 3, 2004. These last two citizens are prisoners in the case of the events of the 11th of April, 2002. The same observations apply to them as to Ivan Simonovis. 18. Lieutenant Colonel Humberto Quintero, arrested illegally on January 12, 2005 and sentenced to 3 years and 8 months in prison, his crime the capture of Rodrigo Granda, Chancellor of the FARC. 19. General Felipe Rodriguez, arrested illegally on February 6, 2005, unjustly sentenced to 10 years, 4 months in prison in the case of the bombings of the Spanish Embassy and the Colombian Consulate. 20. General Delfin Gomez Parra, arrested illegally on December 3, 2006, stated: "I still cannot understand what are the reasons why they insist upon continually accusing me for deeds which I have not committed, I have not appropriated money that is not mine, I have not stolen from the nation, I have not been paid profits that do not belong to me and only God knows that what I am saying is true, I am only looking ahead to that Divine Justice that is unstoppable and relentless." 21. Colonel Ricardo Alfonso Cedeño, illegally detained on December 3, 2006. 22. Eligio Cedeño, illegally held since February 8, 2007. The trial has begun. All his assets were frozen. 23. Diana Mora Herrera, illegally detained since April 26, 2007. Continues without a trial. 24. Luis Alberto Rodriguez Villamizar, illegally detained since April 26, 2007. Has been accused of belonging to a group financed by the CIA that operates in Venezuela to "destabilize" the government, they have described him as a terrorist and traitor to the country, adding moreover that he is "convicted" and "confessed." They still have not been tried! 25. Jose Rafael Ramirez, illegally detained since April 26, 2006. Arrested for presumed extortion of businessman Wilmer Ruperti. One judge gave him relief: they dismissed the judge and he remains in prison. 26. Jose Alberto Sanchez Montiel (Inspector Mazuco), prisoner for seven months, all actions carried out in his defense have been conveniently disqualified, his case should have been heard in Maracaibo -- the State of Zulia -- but was transferred to Caracas. The journalist Leocenis Garcia, who has been denouncing administrative irregularities in the state-owned oil company PDVSA, is the latest political prisoner of the regime. As I always express it, God moves mountains, I am sure that sunlight will return to shine on Venezuela and these people who have paid so dearly for the deed of dissenting or having fulfilled their professional, civil, or human duty will have justice done and will go out in freedom. It only remains for me to ask my fellow countrymen let us not forget the politically persecuted and imprisoned, let us show solidarity with them and their respective families, that we support the legal complaints carried out for their defense, that we pray to keep their morale strengthened, because among all of us they have been singled out to carry a very heavy burden on their shoulders. This is a worthwhile story I intend to address more in the future. For now, I at least have their names up for view. I have some sad news and I hope it does not stand as a permanent development. Nora at Spanish Pundit has at least temporarily suspended her blogging. She seems to express some disappointment that the blogosphere is not reaching a wider audience and that attacks upon freedom of expression through blogging appear to be gaining ground worldwide. Nora has created a Spanish language Google group to monitor and publicize these threats and she has promised to continue her work there, which is only a small piece of good news. It may be worth noting that Nora has expressed this frustration in the wake of her incredulous observations of the treatment of terrorist leader Abu Qutada, a Muslim cleric with known links to Al Qaeda, who was recently released on bail in Great Britain after winning an extradition fight to prevent his deportation to Jordan, and on top of that the recent death of a Spanish judge who was expected to rule against the Zapatero government on key cases involving homsexual marriage, Catalonian rights, and more. I also think it deserves mentioning here that some key individuals I am fond of referring to as "freedom bloggers" have been hit with hacking attacks recently, including Martha Colmenares, whose site was out of action for over two weeks. Nora is very well aware of these attacks and I think it evidently is taking a toll, since the resigned tone of her advisement that she is in hiatus for now states very clearly that she is not enthusiastic about the prospects for winning this struggle for free expression through blogging. I will be leaving a comment for Nora at her post, but I would just like to state some words of encouragement here as well. Nora is among that very select group of bloggers who have made the cause of securing freedom a worthwhile end, she has been an inspiration to me, and I hope she returns to active blogging because we can never have enough spokeswomen of her character and stature. In spite of a boycott of the autonomy referendum ordered by Evo Morales's MAS Party and a Saturday bombing of a television station in the city of Yacuiba, voters in the Bolivian Department of Tarija showed up in significant numbers Sunday to cast their ballots on the fourth autonomy referendum of the last two months. Though at this early stage of the returns it would not be fair to publish final results, it is fairly clear that the referendum will pass by a significant margin. The first set of numbers published at the Santa Cruz (Dept. of Santa Cruz) newspaper El Deber website showed the "Yes" votes (for autonomy) leading by 78.9% to 21.1% against the measure. I will post a Monday update after final results are in, along with other relevant information, since I have learned that the news does not come in as rapidly as one might hope on election day. The television station bombing in Yacuiba occurred at 5:00 a.m. local time Saturday, which meant there were no casualties. Police have arrested at least three suspects, one of whom is a Sub-Lieutenant (2nd Lieutenant) in the Bolivian Army named George Peter Nava Zurita who it was reported is a member of the security team at the military office at the seat of government in La Paz. Two younger university students, one from La Paz and another from Santa Cruz were also taken into custody. No other details are available at this time. Gustavo Coronel has put up a short but excellent overview of recent events in Latin America which seem to suggest that Hugo Chavez's international aspirations for spreading his Bolivarian revolution are failing and that the momentum is currently against him almost everywhere in the region. And Coronel's opinion is not entirely his own, as you will be able to read that many among the Latin American Left have been angered over Chavez's recent about face in his announcement of his withdrawal of support for the FARC in the wake of the revelations emanating from the laptops of slain narcoguerrilla leader Raul Reyes, which have turned international opinion against Chavez to a considerable degree and emboldened the opposition to leftist regimes he supports throughout Latin America. I would like to point out that in a recent blog entry of my own I wrote that "I believe that the current political trends in the region are against Chavez and Populism" as I discussed the prospects for a post-Chavez era in Venezuela. 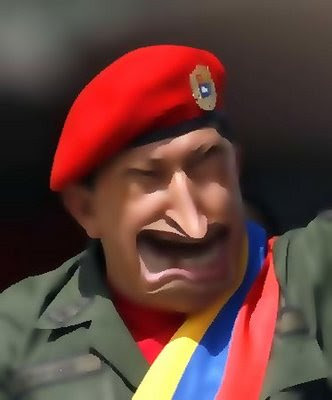 In Coronel's blog you will see that some of the latest developments in Bolivia, Argentina, Ecuador, and Cuba all portend for the imminent failure of Chavez's political project and may point to the impending end of his own tenure in Venezuela as well. Given that the evidence presented is of much more recent origin I think it safe to say that you can believe Coronel's version more easily than mine. Here is the link. Go and read "SOCIALISM OF THE XXI CENTURY IS STILLBORN." I'm making this blog entry as something of a blog research note on the issue of the U.S. trade embargo against Cuba. It seems that there is an awakening interest among many bloggers I personally count among the "good guys" -- the anti-Castro, true lovers of freedom crowd -- who are urging that the U.S. should rethink the usefulness and/or efficacy of the trade embargo imposed against Cuba. I think I have seen enough in recent weeks to stop and enter a post here asking readers to consider the matter as something worthy of attention. First; let me give you some facts. The "embargo" is a term that is usually used to refer to both the limitation of exports of non-food and non-medicinal American commodities to Cuba, as well as prohibitions against the import of Cuban products into the U.S., especially sugar. It has been a complicated economic policy that began with an embargo on shipments of military goods to Cuba in March, 1958 that was later expanded to include sanctions against the import into America of Cuban sugar in 1960 and has since undergone periods of revision in both the temporary relaxation of restrictions on U.S. exports to the island, as in the period 1977-1982, interspersed with sometimes complex restrictions on what the levels of American economic contact with Cuba and the Cuban people should be under law. Exports of American food and medicine always have been permitted, but the big issue is the level of person-to-person contact, which is a matter of major concern among many Cuban immigrant families in the U.S., who would like to be able to send greater financial assistance to their relatives and loved ones remaining on the island. I am going to skip an overview of the arguments put forth by the pro-Fidel sympathizers here in the U.S., which usually come down to the hateful gringos resenting the rise of a truly democratic [sic] revolution of the left so close to their shores and the policy is implemented on behalf of the Cuban-American "fat cats" in Miami who left with all that money when Castro came to power, and, well; you get that picture clearly enough. However, I would like to point out that there are two groups calling for either an end to or revision of the embargo who deserve our attention; Cuban dissidents now resident on the island, as well as numerous and genuine "freedom blogger" commentators outside of it. I think these are people whose arguments merit an examination, because they are working conscientiously to bring an end to Castro's tyranny and I am all for that under any circumstances. Let me identify three very important Cuban dissident elements who are asking Americans to end the embargo; the well-known Generación Y blogger Yoani Sanchez, prominent Cuban dissident and political activist Martha Beatriz Roque (you can find both on the sidebar), and the organization of women known as the Damas de Blanco (Ladies in White) who are seeking freedom for Cuban political prisoners. All three have stood up to the Castro regime under the most difficult of circumstances, which should give them credibility. And I do not offer this comment by way of suggesting that we should accept their arguments simply because they are Cuban dissidents in place, because Yoani did say she preferred Barack Obama to John McCain and I am in no doubt that Obama has some more than questionable credentials with respect to support for democracy and freedom in Latin America. He has close ties to some of Hugo Chavez's biggest supporters in America, including George Soros the main man for Evo Morales, along with a near hatred of the Colombian government. These are but two of many things that make him look dangerous and no matter how hard we try to get him to answer some of the tough questions that would clarify his positions on these issues he refuses to respond, leaving us unassured of his good faith. But I think we can write off the comments of the Cuban dissidents on Obama to naiveté, since they do not receive all the information we get with easy access to our media. The important thing for us is to filter out what lies underneath the declarations of the Cuban resistance to Castro -- the embargo is hurting those who are trying to make a difference. That is a statement worth listening to in my opinion. There are a few worthy bloggers who have also called for a re-examination of the embargo recently, including at least two who have very high credibility with me for their proven record of consistent activism in the cause of freedom. Marc Masferrer at Uncommon Sense has been doing an excellent job in tracking the plight of political prisoners in Cuba for some time now, and he recently posted a plea to avoid implementing the embargo in a way that hurts ordinary Cubans, especially the relatives of Cuban-American emigrés who would wish to travel to the island and send amounts of money above the limits imposed by law at present (which were $100 per month according to the last report I read). Marc had already made a similar statement last year when he identified the problems with permitting one type of trade that benefited American farmers while forbidding transit for Americans of Cuban descent to visit family members; setting up priorities he described as "skewed." And now Alek Boyd, who for the last three years or more has been one of the most important bloggers publicizing the case against Hugo Chavez and whose work I have followed quite closely has made an even stronger statement, urging that the embargo has been counterproductive as a whole and should be scrapped altogether. The main points of Alek's argument are that the embargo has strengthened the stature of the Castro regime internationally for the attention it gets in its conflict with the American superpower to the north, the policy has hurt those people in Cuba we would wish to help most, the developing Cuban dissident movement is asking for our assistance by requesting an end to the policy, and removing the embargo will strip the Castro regime of the only excuse it has had to hold up to the Cuban people for its inability to provide them with the promised benefits of a revolution that has failed utterly at every level. These are two very different approaches to a re-examination of the embargo, and I expect Alek Boyd's proposal will generate some strong opposition among many who pay close attention to the Castro regime. But I must repeat what I wrote in the previous paragraph, which is that I have read Alek's blogging on numerous issues affecting freedom and democracy in Latin America and I believe his extensive record of service in the causes of each merits a fair hearing for his proposal. So what do I think? Well; like Marc Masferrer I am most concerned about the plight of the Cuban people themselves; especially those who have been cut off from work opportunities by the Castro regime for maintaining contacts with their relatives and loved ones here in the U.S. I do advocate loosening the restrictions on the amount of money families can send to relatives in Cuba and I would like to see travel restrictions relaxed to make their passage to and from the island a lot easier than it is now. I recognize that Alek Boyd has presented a very thoughtful and well-intentioned argument against the wisdom of the embargo, but I still see the flip side of its immediate and total elimination as resulting in the gravitation of new financial resources -- read "liquidity" -- into the hands of the regime which would be a counterproductive result and therefore is a course I am unwilling to recommend without seeing some signs of progress on democracy and human rights, and I immediately demand a release of the political prisoners in that regard. My suggestion for a process that can result in the lifting of the embargo is that we Americans first agree upon a basic principle, which is that we will attempt to separate what benefits the Castro regime from what helps the Cuban people and that we then sit down and ask ourselves how the outlines of a policy that would achieve the genuine aim of improving the condition of ordinary Cubans can best be formulated. Then we take the first step. Dramatically raise the limit on monthly cash disbursements American families can send to relatives in Cuba. Ease travel restrictions for Americans wishing to visit their relatives and loved ones on the island. Open up American export trade to Cuba -- which is already larger than many people think for our agricultural products -- to include consumer goods not useful to the regime for purposes other than private use. I recommend that we take the above three steps unilaterally without any preconditions so that we can then turn to the Castro regime and say "it's your turn," leaving the onus to respond entirely upon their shoulders. 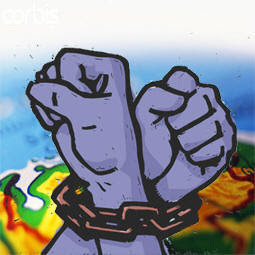 And it may be useful to propose a gradualized process of trading one specific step for another in return that will lead eventually to the complete renewal of trade and the full recognition of human rights in Cuba, rather than insisting upon a complete capitulation to all terms at once, which we should understand is a political impossibility for the Castro regime. However, we must demand the release of all political prisoners as an absolutely necessary first step, and, as distasteful as it may be to bargain, gradually work our way to the restoration of full political rights. Step by step, solid action for meaningful response, engaging in an open and meaningful process that produces results and does not imply capitulation for either side. I do not believe that there will be any turning back for the Castro regime once it starts the process as it will most certainly involve the Cuban people in a way they have never been mobilized before; a development that can have but one result -- freedom. 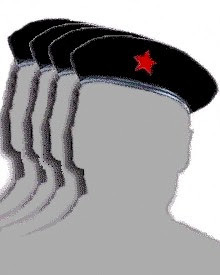 Laz at Cuba Independiente is continuing his very fine work of keeping tabs on the Castroite Blogger who uses the pseudonym "Yohandry," who I have examined myself in a recent post. This past Thursday Laz put up an excellent examination of Yohandry, in which he uses a little touch of excess to drive home a simple point that is becoming increasingly hard to deny -- Yohandry is not one blogger, but rather a group. And the significance of this observation is that it is becoming increasingly apparent that the attacks on Yoani are an organized effort on the part of the regime to discredit her. "The individual who calls himself Yohandry Fontana Guethon [he has forgotten the 2nd lastname in his new blog] who at one time confessed that he was directly responsible, under different pseudonyms, for 90% of the comments that were made in Generacion Y, which itself is a full-time job with several extra hours a day incompatible with his declared profession of doctor. Bear in mind that on average a Yoani post generates about 3000 comments, for which Yohandry averaged some 2,700 comments. Assuming that Yohandry sleeps about 7 hours a day and takes another two hours to eat, bathe, and one hour to read what Yoani posts, to receive guidance and read el Granma, we would have his maximum available time at 14 hours. So to get up to 2700 comments, Yohandry has to post them at a reasonable rate of 192.86 per hour or by the same count, 3.21 comments per minute. If someone can demonstrate that he can do this day after day, the best thing they can do is to summon the Guinness judge because he has an assured record. But that is not all, Yohandry states that he is a doctor and works as such, for which he would have to deduct another 8 hours minimum [I am not considering the trip back and forth to work because Yohandry could be a family physician who lives on the 2nd floor of the clinic. Neither am I leaving out the time to do his "errands," union meetings, party meetings, meetings with his commander nor those which any doctor has in the clinic and the town. ]; for which the real maximum effective time that Yohandry can dedicate to commenting in Yoani's blog is itself limited to 6 hours daily [14-8] and then Yohandry's efficiency and productivity reaches inhuman levels: 450 comments per hour or 7.5 per minute and if a Yohandry comment is 30 words, then he writes at the incredible speed of 225 words per minute!!! On the other hand Yohandry says that he is 37 years old, for which he would have been born in the year 1970 or 1971; while the fashion of names that begin with "Y" in Cuba began in the 2nd half of the 70's with its boom in the 80's as Yoani explains clearly. It is not impossible, but it is unlikely that a child born in Cuba in the year 1970 or 1971 has a name that begins with "Y" and that their parents chose a name quite unusual for the time of the cane harvest of the 10 million volunteers, when Bolshevik names were the fashion, Vladimir, Natasha, Nadia, and so on. In a world where uncertainty reigns and the truth is more relative than ever, the sensible analysis of the circumstances of the person Yohandry indicate that he is not one person but a group that has the mission of deploying an ideological offensive from Havana in the blog world. . . ."
Laz goes on to point out that the Cuban government has been open about its plans to use the internet to propagandize the regime and he gives examples to get to the point that "Yohandry is only a crude way to put into practice the concepts that the leadership in Cuba has publicly expressed about the 'ideological battle' on the Internet." And he continues with one of Yohandry's recent blogs which he introduces in the context of its presentation, which strengthens his point further. I believe Laz is correct. Yohandry cannot be one person and it is not an accident that he is getting so much publicity from official circles in Havana. Amidst all the noise that has followed from the political, economic, and social upheaval now underway in Venezuela owing to the corruption and mismanagement of the Hugo Chavez presidency, there have been few attempts to sit down and patiently rationalize a comprehensive plan to provide solutions to the complex set of problems Venezuelans will have to face if they are to overcome the disaster that now threatens their people and their future. Naturally; the implementation of such an effort must come from the anti-Chavista elements within the country. It goes without saying that they would need significant help from abroad to focus the concerned attention of the outside world upon Venezuela so as to create a political opening that would permit them to pursue a post-Chavez reform program through democratic means that are only partially available to them at present. And if they are aggressive enough, they may decide to ask for help to assist them in the formulation of that program. Thus the raison d'être for ProVeo.org, a private organization of over 1900 members in at least 55 countries worldwide. Its founder and director is Aleksander Boyd, well-known for his work at VCrisis.com, which has publicized the plight of the country since at least August, 2003; a date I gather from my glance at the site's archive page. The organization is working along several fronts to promote "a peaceful, democratic resolution" to the crisis in Venezuela and to raise international public awareness of the situation within the country. In so far as they seek assistance from abroad, they are looking to those who can help to publicize current conditions in Venezuela and they also openly invite academics and other professionals with the necessary expertise to contribute to the development of solutions to the myriad set of complex problems that now confront their nation; they want a pragmatic program that will work, a good deal of which they now understand, but they recognize that much more work must be done before its final shape comes to fruition. At present, their activities are mostly focused upon organizing public events outside of Venezuela and encouraging communication among members of the opposition within the country and helpful individuals outside of it to give substance to a post-Chavez program that can be achieved through democratic means. ". . . It is our conviction that, only a NEW POLITICAL PARTY, totally disconnected from the past and present can face the future. A grand party, broad-based, inclusive, Venezuelan, able to interpret and represent the aspirations of today's Venezuela. . . ."
One can find the theme of uniting the opposition to Chavez repeated in several places on the ProVeo.org web site. Beyond that political goal, the specifics of a program are more generalized as the group recognizes that an inclusive political movement or party must also present an inclusive agenda. But that is not to suggest they lack a plan with specifics, because there is quite a bit about which they are soundly convinced. I have posted a translation of a document to accompany this post that outlines fourteen major proposals ProVeo.org puts forth as constituting the immediate basis upon which an anti-Chavez opposition should unite. They pay special attention to problems of public security and the inefficiency and corruption in the exercise of police authority in Venezuela which they believe have produced a criminal environment that is a direct result of Chavez's policies. Point number 5 -- "Implementation of a program of an ongoing military presence and patrols at the borders" -- is notable for its obvious relationship to Chavez's support of the FARC and other Colombian narcoguerrillas who benefit from protected enclaves within Venezuela, a debilitating factor for public order that the organization does not omit from its program and which it supports further in a call for the "Prosecution and imprisonment for the perpetrators of crimes against humanity," which no doubt also includes holding Chavez accountable for the events of April 11, 2002. There are also calls for bureaucratic reform at several levels; in education, where the organization seeks to end the political indoctrination that Chavez is now implementing in direct violation of its overwhelming rejection by Venezuelan voters as a constitutional referendum measure last December. ProVeo.org also urges a return of the state-owned national oil company PDVSA (Petróleos de Venezuela), to its former professional model, a proposal in which they seek to address what may be the most significant instance of corruption in the entire Chavez regime. ProVeo.org's proposals for a post-Chavez economic reform program are perhaps less fixed in terms of the finer points, and for good reason, as unifying the opposition in Venezuela will require an inclusive development plan in which the various sectors and parties of the country are given an opportunity to contribute their ideas and see their interests represented in the final platform. Still, the broad outlines are understood and presented in abstract form. In two articles (Link 1 and Link 2) Francisco Toro -- of the Caracas Chronicles blog -- presents a broad outline for an economic reform plan that identifies the most essential parts. Writ large, the plan Toro suggests would fall under the heading of "Neo-Liberalism," for those who study Latin American politics, since it would emphasize the strengthening of and a reliance upon the major political and economic institutions of the country. But Toro makes clear that urging institutional reform in and of itself is not enough, it is important to consider the underlying economic factors that form the framework within which institutional reform operates, especially the need to manage the technological base for a modern economy, which he feels is particularly at risk under Chavez's mismanagement. Yes; the bureaucratic reforms are important as an antidote to corruption, as one would see in any Neo-Liberal agenda. But of at least equal significance is guiding Venezuela's institutions towards the implementation of a massive investment in the strengthening of the country's scientific and technological base at all levels; education, material infrastructure, and more. The key element in the project is inclusiveness; an approach that mandates a broadening of "stakeholder interest," making certain that public-private partnerships encourage investment in the technological base, constantly moving the Venezuelan economy towards a more knowledge-intensive production model. And finally; the relationship between fiscal and social reform is presented in light of a shrinking Venezuelan economy that is increasingly unable to meet its social commitments. It is not a choice between growth or development in social policy. A successful program for social development can only be achieved if the Venezuelan economy grows and creates new wealth that can be applied to social programs. Economic growth must be a cornerstone of fiscal reform and the public sector's share of the economy can be enlarged as growth creates the opportunity to apply new resources to the solutions of social inequality in Venezuela. No one said this would be easy. Chavez's control of the Venezuelan courts, the national assembly, and the National Electoral Council have enabled him to rewrite old laws, reinterpret existing ones, and corrupt the electoral process; all to his advantage. He has also continued a slow but steady campaign of repression -- it's the only word that fits -- of the news media, for which he has been roundly criticized by international press and human rights organizations. And perhaps most dangerously for the future, Chavez is creating a state militia that answers directly to him and he is reorganizing the national police and intelligence services in ways that openly monitor and intimidate his opponents. But in spite of all of these facts, the opposition to Chavez has been increasing steadily in recent months. If I may offer my own observation, I believe that the current political trends in the region are against Chavez and Populism, which is important when considering the prospects for the future. I think it is reasonable to suggest that the year 2006 was the high tide of Populism in Latin America; the point at which they achieved their greatest successes and began to experience their first setbacks. In that year, three populist candidates won presidential elections; Rafael Correa in Ecuador, Daniel Ortega in Nicaragua, and Hugo Chavez, who was re-elected in Venezuela. But those victories were not everything they appeared to be at first glance. Correa has perhaps done best politically since his election, seeing his party's strength grow in the Ecuadoran congress and getting a lot of mileage from national resentment of Colombia's cross-border incursion this past March, but even so the opposition remains quite active and the process of revealing Correa's contacts and sources of support outside the country has begun, and it will continue to his detriment. Ortega's victory came by virtue of a unique constitutional formula that mathematically allowed him to win with only 40% of the vote against a very divided and irresponsible opposition. His exercise of power within Nicaragua has been severely limited and his already very low popularity continues to fall each day. And even Chavez found himself immersed in a real campaign in 2006, facing a powerful opposition for the first time since he assumed office. That opposition has continued to grow. It was also in 2006 that Mexican Populist candidate Andres Manuel Lopez Obrador lost in Mexico, perhaps signalling the beginning of the changing trend that has continued since then. Last year Hugo Chavez lost on a series of constitutional referenda, including one that would have ended limits to the term of his presidency. The margin of victory was apparently significant; and I use the word "apparently" because Venezuela's National Electoral Council has still not released the official vote counts, in clear contradiction of Venezuelan law, which shows Chavez's need to control damaging news. This year in Bolivia -- another "Bolivarian Project" -- Evo Morales has overplayed his hand in attempting to ram his new constitution down the throats of his opposition in clear contravention of existing laws and the surging autonomy movement in the Media Luna departments of Bolivia's east has resulted. And in Venezuela there are signs that the opposition may be taking some heart from the public disgrace Chavez has faced over the Interpol report of the contents of the laptops of Raul Reyes. It is in the press daily and protests, especially among a newly-awakened and vibrant student population, are growing apace. There are key local governmental offices and governorships at stake in this fall's elections and there are signs that Chavez may be in trouble. One recent note posted at the Caracas El Universal site stated that Chavez's candidates were trailing in 200 out of 335 municipal elections and 15 out of 24 governorships up for grabs this year. It is not impossible that Chavez could be in serious difficulty already and he may be threatening action against the opposition if the coming elections go against him, a result some, like Tal Cual editor Teodoro Petkoff, believe he has already recognized. It is impossible to tell, but for the moment I will express my hope that Alek Boyd and everyone else at ProVeo.org finds success in promoting the idea of a unified opposition and a more substantial discussion of what a post-Chavez agenda should look like. Efforts to publicize the problems outside of Venezuela are only a very small part of the bigger picture, but each little piece has its own place and I think ProVeo.org deserves our best wishes. By the way, I signed up and joined. The following document is a translation of ProVeo.org's Propuesta de restructuracion nacional which I have included as a supplemental post to accompany the introduction to the organization I have posted in a separate blog entry. 1. To strengthen personal and community security at the national level. Immediate reorganization of police bodies and military forces. 2. De-politicization of national institutions: (judicial and legal system, electoral system, health care, DIEX [Identification and Immigration Office], etc. 3. An immediate and definitive eradication of armed groups of civilians in the service of the executive. To extradite groups infiltrating agencies of the state, brought from abroad for such purposes. 4. Immediate reform of the Organic Code of Criminal Procedure. 5. Implementation of a program of an ongoing military presence and patrols at the borders. 6. To reformulate economic policy, doing away with populist pseudo-socialist politicking. It has been proved that such programs have not produced any positive result towards the eradication of poverty in any country in the world, on the contrary, they have introduced a dangerous phenomenon: the proliferation of excessive corruption at all levels, a direct product of the all-powerful and clientelist state. 7. Complete and profound revision of all educational programs, and to eradicate those which relate to "political catechism," as is now happening. To initiate an educational campaign of easy access and understanding for all sectors in matters of politics, economics, and history. 8. To rebuild PDVSA [Petróleos de Venezuela], restoring all technical/executive personnel to their duties. Immediate dismissal of all government officials and people outside the industry. 9. To reactivate and modernize the economy on the basis of absolute freedom, eliminating the interventionism of the state and obsolete labor laws. 10. To reformulate foreign policy. To eliminate relationships and commitments with avowedly Marxist and authoritarian countries that are detrimental to the interests of the nation (Read Cuba). 11. To regain the trust and respect at the international level of those friendly countries who represent an example for democratic Venezuela. To regain the trust of domestic and international investors, offering a legal and juridical framework that guarantees the security and stability of their investments. 12. To implement a program of the eradication of poverty and illiteracy. 13. Prosecution and imprisonment for the perpetrators of crimes against humanity. 14. To eliminate the use and abuse of the name of Bolivar and the Bolivarian ideals that have been vilely distorted for political purposes totally opposed to the teachings of the Father of the Country. Alek Boyd of VCrisis.com and ProVeo.org has an absolutely fascinating account of an interview with Cuban blogger Yoani Sanchez up at his personal blog that is a must read. Alek went to Cuba and managed to arrange a sit-down with Yoani and her husband, independent Cuban journalist Reinaldo Escobar -- you can check out his Desde aquí blog from the sidebar -- and though the portion of their talk which Alek relates is brief, it is also very revealing. Yoani's capacity for soft and delicate statements shines through. ". . . I am all up for debate, for the creation of a space where Cubans and interested parties can debate about issues affecting us in a mature, respectful manner. . . ."
It may not sound like much to those of us here in the United States, but those few words about "a space where Cubans and interested parties can debate" are a very powerful antidote to the repression of Castroite Cuba. I am very grateful to Laz at Cuba Independiente, a blog you will see I have linked in my sidebar at the right under my América Latina Libre category, who has honored me with his personal Premio al Blog con Huellas 2008 prize. I am in very good company as the other four recepients are none other than Yoani Sanchez's Generación Y blog, which does so much to tell the story of living in Castro's Cuba; Marta Beatriz Roque Info, a second blog of a Cuban dissident who lives on the island and which pays closer attention to Cuban internal politics and efforts to publicize the plight of political prisoners within the country; DAZIBAO-Ñ-., an extremely interesting blog from Spain by a Chinese immigrant living there who pays very close attention to jihadism, human rights in China, and la Pesoe, the program of the Spanish Socialist Workers Party (Partido Socialista Obrero Español) of Zapatero; and Birmania Free, an almost unknown blog in Spanish that may have the best coverage of the on-going tragedy in Burma in any language. As the only American blogger included in this list, I take this recognition from Cuba Independiente to be a special honor. For those of you who may not know much about the Cuba Independiente blog, allow me to say a few things you may find interesting. First, foremost, and not surprisingly so; it is a Spanish-language blog dedicated to exactly the principle embodied in its title, a free and independent Cuba (that means an end to Castroite rule on the island). It is a very active site, by which I mean that it literally contains thousands of posts, many of which link readers to individual articles worthy of recognition. But unlike some blogs which only post the links and leave readers to inform themselves, Cuba Indpendiente's Laz includes a running commentary of his own that is usually short and to the point. Laz takes a hard line against Castro, but in my opinion, that is a very good thing, and it speaks volumes for his motivation. And I should point out that Cuba Independiente has been recognized with awards of its own that are both numerous and which come from some blogging sites and organizations I regard as very distinguished. I am a frequent visitor to Cuba Independiente for reasons of the broad range of its posted entries and the attitudes expressed in the selection of topics and Laz's simple, but insightful commentary. It is a true Freedom Blog. Estoy muy agradecido Laz. Mereces un buen aludo. Voters in the Bolivian Departments of Beni and Pando approved individual referendums Sunday to establish their autonomy from the central government in La Paz by overwhelming margins. 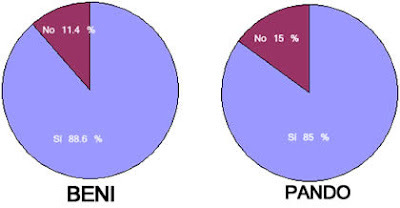 In Beni the vote was 88.6% For to 11.4% Against and in Pando the split was 85% to 15%. The two departments joined neighboring Santa Cruz, which approved its own autonomy measure on May 4 with over 86% voting in favor. 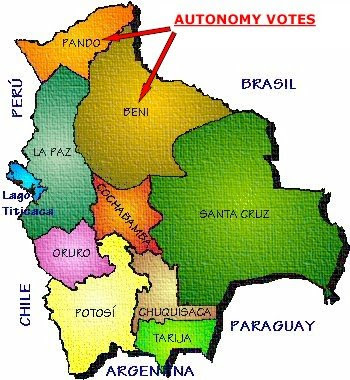 The final referendum to be held later this month will take place in the southernmost department of Tarija on June 22, where prognostications suggest that voters will show a similar level of support as did their neighbors in the other three departments of the so-called Media Luna region of eastern Bolivia. There were reports of isolated incidents in both departments where activists - read "thugs" - from Evo Morales's MAS Party set up blockades in some of the more remote regions to harass voters, but apparently not achieving significant success. The Prefect of Pando, Leopoldo Fernandez, said that some 2,500 people were probably prevented from voting and he pointedly blamed Bolivian President Evo Morales for instigating the action of his MAS supporters. In Beni Masistas blocked the main highway into the city of Yacumo in the western part of the department and apparently assaulted and beat up the city's mayor, who was taken to a hospital where he was treated for head injuries. In Beni's capital city of Trinidad there were separate instances in which Mas supporters faced off against both local residents and some youths from the Union Juvenil of Santa Cruz, who showed up in support of their Beni neighbors. At one point police were called in to disrupt one confrontation.